There are so many origami books written specifically on flowers these days. As a woman who loves all kinds of pretty, I, of course love making flowers out of origami and own quite a few books on this topic. 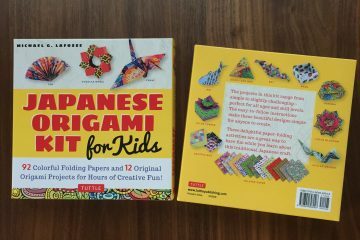 This Origami Flowers kit seemed different from any others that I already own so I got quite excited when I received a pre-published copy from Tuttle Publishing! 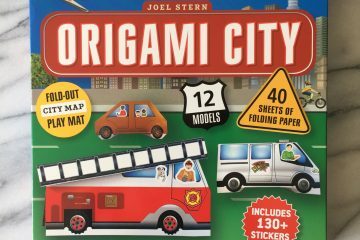 It is a complete kit that comes in a nice box with an instructional book and DVD as well as 180 sheets of origami paper. There are instructions for 18 different flowers, which are all original and unique, except for the traditional lily model. All of the included models are three dimensional, and about a half of them are modular flowers that use one sheet of paper for each petal. I must admit that I am not particularly fond of modular origami because I get tired of folding a same model over and over for more than a dozen times. But I certainly was able to stay focused to fold the same model for only 3-6 times and enjoyed each modular project. Here are some of the models that I folded from the book. The first model that I folded out of this book was called Star Flower, which has several variations. I was going to participate in the Portland Pride Parade on the next day so I decided to fold this flower in rainbow colors and made it into a pin. I received a lot of complements on it at the parade. A Maple Leaf model that I folded was turned into a Canadian flag with another sheet of red origami paper for Canada Day. Plumeria is definitely one of my favorite flowers, and what I love about it is the beautiful gradations of colors. I did not use the paper that came in the kit for this one, but instead I used 6×6 Harmony origami paper that I cut into quarters. I used the paper that came in the kit to make this Anne’s Orchid, as well as the butterfly, which is also by the same authors’ and included in the Origami Butterflies book. I attached the flowers to a house plant stem with a hot glue gun, and the butterfly is on a floral wire. Selecting high quality, long-fiber handmade paper to wet-fold this model is suggested in the book, which I’ll do next time when I fold this model. While taking this photo my dog came to photobomb…:-/ This is called Petallunia Moon Flower, and it is a modular design that uses 6 pieces of paper. I used 3×3 paper from the kit, and it has a depth of about 2.5 inches. I guess it can hold a little trinkets inside. 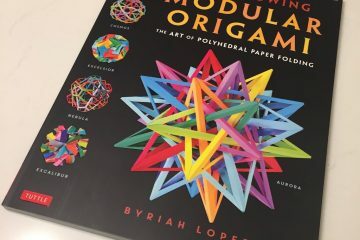 There are some simple models but also more challenging, intermediate to lower end of advanced models, included in the book as well so it can attract large populations of origami enthusiasts. I very much enjoyed LaFosse & Alexander’s Origami Flowers kit so far and look forward to fold more from it. This kit just got published very recently, and you can purchase it directly from Tuttle, or from Powell’s, Amazon’s, and other major bookstores.